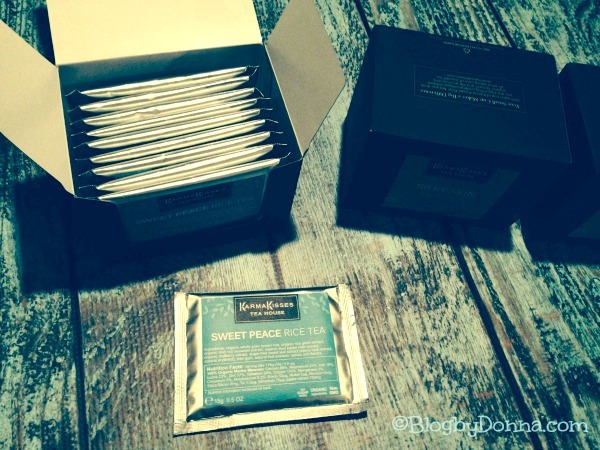 This feel good, tastes good, and do some good in the world post has been brought to you by Karma Kisses Tea House…. I had never heard of rice tea before. That is until recently, when I was asked if I’d like to try some rice tea from Karma Kisses Tea House. Honestly, I was intrigued by not only “rice” tea, but also by the company’s name. What a great name is Karma Kisses? I know, right? Our mission at Karma Kisses is to create high-performance natural foods and drinks that are powered by nature and supported by science. We use potent plants, organic ingredients and a healthy dose of love for what we do. We are committed to helping you maintain your very best health, at the same time as helping those in need and protecting the planet’s resources. Our commitment is backed by action, with earth- and animal-friendly practices. I highly recommend you read their story, I think, like me, you’ll be impressed with Karma Kisses Tea House. Sweet Peace Rice Tea – Flow away from the daily stresses of life and take a deep breath to release your tensions… Enjoy the calming, magical power of the Irish Sea. The precious, organic Irish red seaweed combines with organic rice to relax the mind and stay the troubles of the soul. It helps promote a restful state of peace with all the natural seaweed minerals and fruit nutrients found in abundance beneath the water. Silky Skin Rice Tea – From high in the Tibetan Himalayas, where time is still being born, comes Sea Buckthorn. Not to be confused with common buckthorn, this is one of the most nutritious fruits on the planet. Combined with organic rice, it delivers unique nutrients to nourish the skin, hair and nails. The precious fruit oils found in Sea Buckthorn, including Omegas 3, 6, and 9, and the elusive essential fatty acid, Omega-7… Silky Skin Rice Tea is a powerful beverage for your healthy youthful glow. I found all the teas to be rather sweet. If you sweeten your teas, you may find the rice teas perfect. My husband does. Karma Kisses rice teas don’t have sugar in them, though. They are sweetened from the all-natural sweet leaf (Stevia). But since I don’t sweeten my tea though, I found them just a bit too sweet for my taste. To remedy that, I just added more warm water. The temperature of the water is key, too. You don’t want the water too hot because it can break down the nutrients. The tea doesn’t come in bags, but in powder form. I found it best to just stir it really well. I plan on experimenting with them in some smoothies. With all the health benefits and all-natural ingredients, I think I could come up with some tasty and healthy smoothies. I love that they only use organic, non-GMO ingredients in their rice teas. I can feel good about my family and I drinking them. 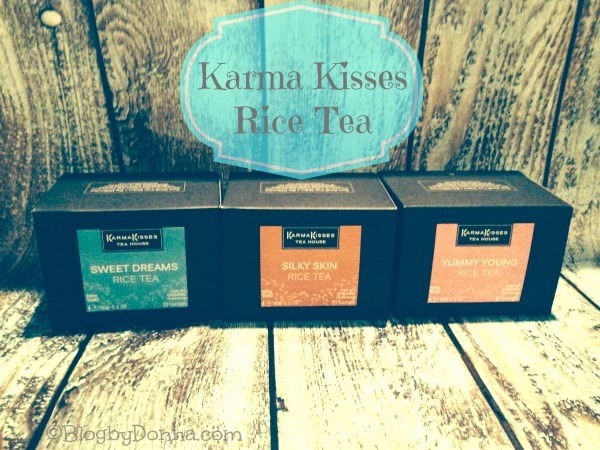 Another thing that I LOVE about Karma Kisses Rice Tea is their Good Karma Fund…. With every cup of Karma Kisses Rice Tea you drink, you are not only taking care of yourself, but also, supporting underprivileged children, organic farmers and the environment. Now that some good karma! We have committed 20% of all profits to our Good Karma Fund. This dedicated fund supports charities for children care, organic farming and environmental protection. It might also respond to international emergency or poverty relief when needed. We have undertaken to support only outstanding charities with a great cause and a strong proven track record – where the money is put to the best use possible. Check out the charities that Karma Kisses Tea House supports. I’m a firm believer in karma — What goes around, comes around. If you are a tea drinker or know someone who is, and you want to support good health, organic farmers, our environment, and some worthwhile charities, you can purchase Karma Kisses Rice Teas and have them delivered right to your door. Thanks to the good people at Karma Kisses, they are giving three (3) of my Blog by Donna readers a box of Yummy Young Rice Tea. Open to U.S. residents, 18+ older. Enter on the Rafflecopter form below. Good luck! Disclosure: I was provided complimentary rice tea for review purposes. All opinions are 100% mine and may differ from yours. I will only endorse companies, products, and services that I believe, based on my own experiences, are worthy of endorsement. Karma Kisses Rice Tea is made with certified 100% Organic whole grain brown rice from the heavenly “Float Pond” Township in Taitung County on the island of Taiwan. I like that it is organic, non-gmo ingredients and helps underprivileged children. I’ve never heard of tea made with rice! Interesting and also good info about the water temperature! I’ve never heard of rice tea myself…but I like that some of their proceeds goes to charity. Gonna get my entries in! Happy Tuesday hon! I like that is organic and supports good causes. Awesome giveaway, I’ll have to let my mom know about this. She’s a huge tea drinker! I have never heard about rice tea, but I love sweet tea and this certainly looks interesting. I also like that some of their profits go towards charity. I like that they use seaweed as an ingredient. Seaweed is good for my thyroid. I’ve never tried rice tea before but love that they donate a portion of their profits. I would love to try the Silky Skin Rice Tea! Looks like some great tea. I will definitely have to try it. Great giveaway, too. Good luck to all. Love the name! Need to try it! Sounds so wonderful! too bad its only in USA. Happy Thanksgiving for today! 😀 Great blog! 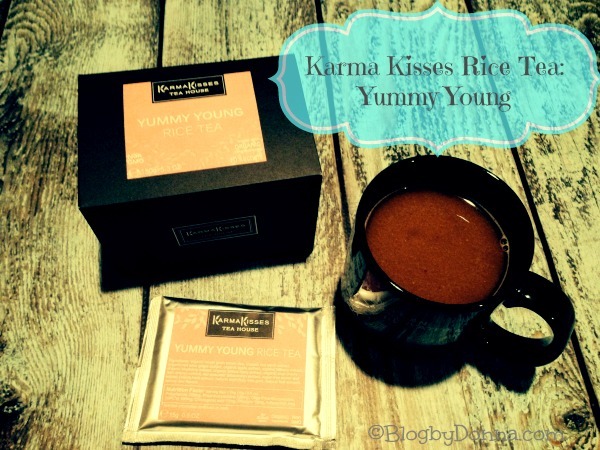 Karma Kisses Rice Teas are Organic, Non-GMO Whole Grain Brown Rice. That it’s organic and that it helps farmers, children and the environment. i have never heard of rice tea before-would love to try it! !